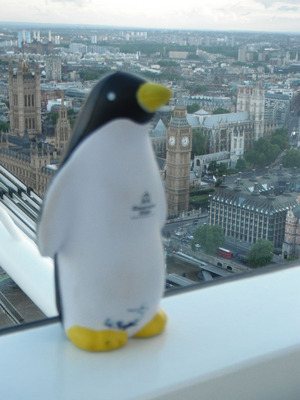 Pierre the Penguin, an unofficial Governors State University mascot, posed with a view of London, England's Big Ben and Parliament in the background. The photo was featured in the article “Pierre in the Ancient World” on "A Penguin in London Town" on pp. 1, 2 of the August 30, 2012 GSU View as part of a Take Pierre on Vacation contest.